Summary: Turbine engine systems have come a long way since they were first developed. One of the most commonly used propulsion systems in the aviation industry is the aircraft turbine engine. Now, these engines vary in design, with each having its own requirements for maintenance and aircraft engine overhaul. 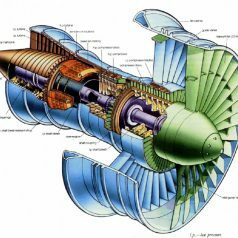 This guide is designed to detail all the specifics of each type of turbine engine so you can thoroughly differentiate one from another. One of the most simplest forms of aircraft turbine engines, the turbojet consists of four sections: the compressor, combustion chamber, turbine section, and exhaust. Now, turbojets were developed prior to World War II in Germany and England. When the gas turbine start up process begins, air is passed through the combustion chamber at lightning fast speed where the fuel inlet and igniter is located. The turbine then causes thrust from the accelerated gases creating a whirlwind. Turboprops drive propellers through a reduction gear, which essentially provides optimal propeller performance even at slower rpm speeds. What this means is that fuel efficiency substantially increases, as well as performance at slow airspeeds. Most small commuter aircrafts like cargo planes and agricultural machines utilize these engines. The propellers tend to function at a lower efficiency as the speed increases, making them ideal for planes that do not require a vast amount of speed. The turbofan is essentially a combination of both the turbojet and turboprops best features. The engine diverts a secondary flow of air around the combustion chamber, which creates an additional thrust. Now, these engines are the most modern versions of aircraft turbine engines and are often found in fighter planes and aircraft that require high-speed transport. They continue to be technologically advanced as new inventions come in, but they still perform their duty admirably – as opposed to having a plane that requires a constant ground power unit on hand at every stop. These engines are predominantly found in fighter jets due to an afterburner that is shelled in a core turbojet, allowing for high speeds and massive energy output. When the afterburner is turned on, additional fuel is injected into the exhaust stream, which allows for even more thrust. Though this does provide an extensive amount of speed for the aircraft, it also burns more fuel than the traditional turbojet aircraft. Bio: Start Pac is home to the finest portable GPU models and designs that the aviation industry has to offer. With the most competitive prices and the largest inventory, Start Pac is your home for ground power units.